The cruise of a ship is a biography. The ship becomes a personification. She not only, "walks the waters like a thing of life," but she speaks in moving accents to those capable of interpreting her. But her interpreter must be a seaman, and not a landsman. Raphael Semmes, the Confederacy's foremost sailor, was writing about his infamous CSS Alabama but the thought applies equally to her successor, the CSS Shenandoah. If the cruise of a ship is a biography, then the ship becomes a central character in a life story through which we view the momentous past more clearly. From October 1864 to November 1865, Shenandoah carried the Civil War around the globe to the ends of the earth through every extreme of sea and storm. Her officers were a cross section of the Confederacy from Old Dominion first families through the Deep South aristocracy to a middle-class Missourian: a nephew of Robert E. Lee, a grandnephew of founder George Mason, a son-in-law to Raphael Semmes, grandsons of men who fought at George Washington's side, and an uncle of Theodore Roosevelt. They considered themselves Americans, Southerners, rebels, and warriors embarking on the voyage of their lives, defending their country as they understood it, and pursuing a difficult, dangerous mission in which they succeeded spectacularly after it no longer mattered. Shenandoah was a magnificent vessel from a rich maritime heritage. She also was a paradigm of dramatic progress in the new industrial age. Her commerce-raiding mission was a central component of U.S. Navy heritage as well as a watery form of asymmetric warfare in the spirit of John Mosby, Bedford Forrest, and W. T. Sherman. Shenandoah's visit to the most remote and most British outpost of the empire--Melbourne, Australia--illuminates crucial international differences and provides a fascinating outsider's view of the conflict. This was the antipodal manifestation of the struggle or the war Down Under. Shenandoah sailed into the vast Pacific and at the paradisiacal island of Pohnpei, burned four more American ships. Southern gentlemen enjoyed a tropical holiday, mingling with an exotic warrior society that was more like them than they knew. As lonely Rebels slept under tropic stars, Richmond went up in flames and guns fell silent at Appomattox. This uniquely American conflagration flared simultaneously at both ends of the earth. Finally, Shenandoah invaded the north, the deep cold of the Bering Sea. She fired the last gun of the conflict, setting crystal waters aglow with flaming Yankee whalers. Seven months after Appomattox, Shenandoah limped into Liverpool. Captain Waddell lowered the last Confederate banner without defeat or surrender. The observations of these Rebel Americans looking back from the most remote and alien surroundings imaginable, along with the viewpoints of those they encountered, provide truly unique perspectives of the conflict. 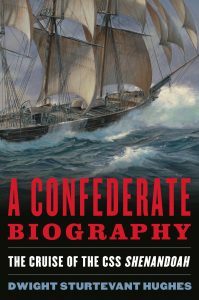 This is, as Admiral Semmes describes, a biography of a cruise and a microcosm of the Confederate-American experience.